Help us flood the new Congress with 100,000 messages in their first 100 days. This is it: The moment when all the work we did together, leading up to November, finally pays off. Right now, new, fresh faces are walking through the halls of Congress — many of whom ran on a clean energy and climate action agenda. 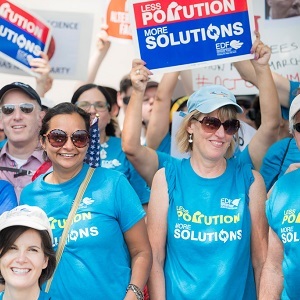 Our job is clear: We need to harness grassroots support for climate action both by standing with climate leaders and ramping up pressure on climate deniers & elected officials that need to be convinced and prodded. Take action today, and help us flood the Congress with 100,000 messages in their first 100 days. Our simple demand? Less pollution, and more solutions! It's time for less pollution, and more solutions. Climate change is a serious and growing threat. We're already seeing its effects in communities across the country, and report after report proves the science is accurate. As your constituent and a resident of [Activist City], I urge you to work with your fellow members of Congress to: 1)	Build bipartisan support for meaningful climate action by backing pro-climate action legislation that moves through Congress. 2)	Protect the EPA by protecting its funding, and holding EPA leadership accountable through tough congressional oversight, and publicly opposing Andrew Wheeler's nomination to serve as EPA Administrator 3)	Oppose the Trump Administration's efforts to put Americans' health and safety at risk by gutting bedrock environmental protections like the Clean Power Plan, clean car and truck standards, methane pollution protections, and limits on mercury and other air toxins. We, the people, are counting on you.